← “The Wolf and the Witch” opens THIS WEEKEND! CLOSING WEEKEND for “The Wolf and the Witch”! Posted on October 9, 2014 by admin | Comments Off on CLOSING WEEKEND for “The Wolf and the Witch”! 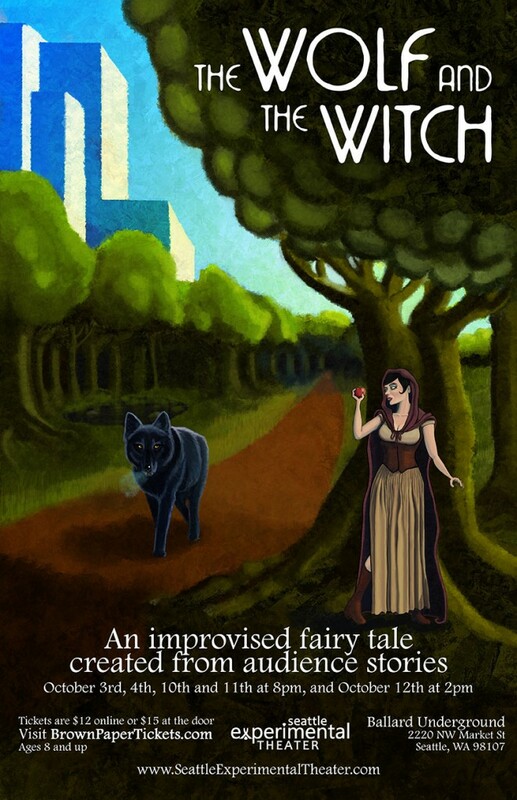 Just three more chances to see the world premiere of our new improvised fairy tale show, “The Wolf and the Witch”, at the Ballard Underground: Friday October 10th at 8PM, Saturday October 11th at 8PM, and Sunday October 12th at 2PM. Tickets are $15 at the door, or $12 in advance at Brown Paper Tickets by clicking here: http://www.brownpapertickets.com/event/840770 Kids get in for just $10. And for those with families, did you know that we’re one of “Erika’s Weekend Picks” on SeattlesChild.com? Our show is appropriate for ages 6 and up. Last weekend’s shows were a great success and delighted audience members of all ages. As an audience member Saturday put it on Facebook, “Great show! Really fun! (5 stars)”. Don’t miss your last chance to see our unique fairy tales come to life!